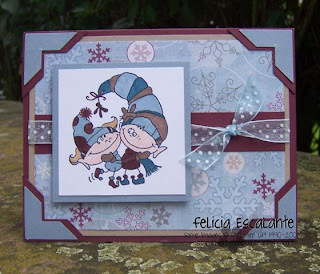 This Mistletoe Pixies image by Stampendous is one of my favorite Christmas stamps. I love how the two are so snuggly. This is my October Christmas card that I will have for Christmas card class in a few weeks. I just ordered some more of the background paper because I love it so much! The background paper is by Sandylion called Let It Snow. I found it at the arts & crafts center at another base near here.